Ease 'er out and let 'er reach! That's what the Corinthian Classic Yacht Regatta is all about. We've said it before and we'll say it again: "Gentlemen don't beat!" Let's have some fun. There's plenty of sea room, free moorings, and some awesome social activities including the Marblehead Maritime Festival and a salute to the Hunt Designs. 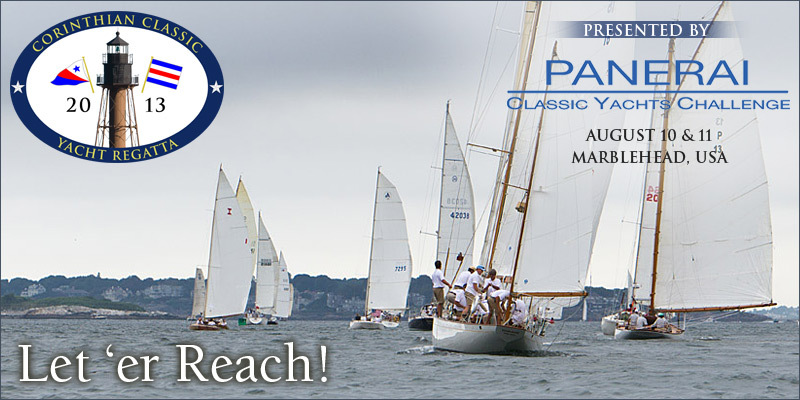 The CCYR is presented by Officine Panerai (www.panerai.com), the title sponsor of the Panerai Classic Yacht Challenge Circuit that takes place in the Mediterranean, Marblehead, Nantucket and Newport. This year's Corinthian Classic will be held August 10th & 11th. www.corinthianclassic.org While we can't take you back to the "golden age" of yachting, we don't think you can get any closer to some fine examples. Don't miss the opportunity to be a part of a classic yachting event - one of the fastest growing segments of yacht racing today. Join us in Marblehead for the Corinthian Classic on August 10th and 11th and in the spirit of Stanley Rosenfeld, we'll make sure that you get a great 8 x 10 photo of your boat - free.